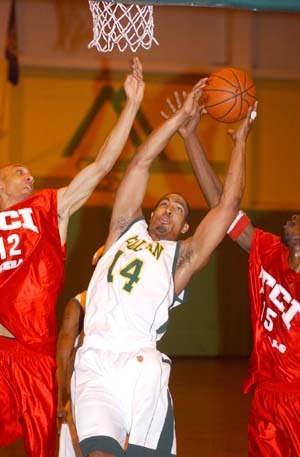 SCCCS JOSEPH MCLEOD grabs a rebound between TCI teammates Cornelio Zapata, left, and Adrian Black. LOCH SHELDRAKE  February 17, 2004  In a game that had some fans in the stands thinking they were seeing double as they read Thursday evenings program, the host Generals of Sullivan County Community College defeated the visiting Generals of Technical Career Institute, 92-78, in a Region XV basketball game Down in the Bunker at Paul Gerry Fieldhouse. In the opening minutes of the game, the lead switched back and forth until SCCC (21-4, 11-4 Region XV) jumped out to a 20-plus point lead. At the half, the local Generals enjoyed a 43-29 lead. As the opposition closed the gap in the final four minutes to 76-70, however, SCCC Coach Chris DePew raved along the sidelines and turned the air blue with a few choice words. A total of five SCCC players broke the double digit scoring ceiling. Leading the way was Darren Sykes, who scored a game-high 36 points and was a perfect 10-of-10 at the free-throw line. The other four SCCC Generals in double figures were Joseph McLeod (19 points), Dante Griggs (12), Keith Bussey (11) and Wayne Coward (10). Four TCI hoopsters scored at least 10 points in the contest. Pacing the team was Keenan Givens, who registered 21 points. Curtis Arnold and Jerrell Strickland each netted 13 and Adrian Black added 11. SCCC shot slightly better from the foul line than TCI. The local Generals were 17-of-25 (68 percent) and the visiting Generals went 16-of-26 (62 percent). TCI Coach Pernell Hosier shouted himself out during the hard-fought game, so he asked his assistant to step up to the plate for a few brief post-game comments. Sims said the tide turned as one of his players got tagged with an offensive foul in the second half when they were down by just six points. DePew said his team earned the win, particularly in light of having several key players sidelined with injuries. Daishawn Fowler is out with a bum foot, Gary Jones has a broken foot and Ghiles Jackson is limping along on an injured knee. I had to rely on my sophomores to step up and carry the load, DePew said. Sykes moved to the point guard position, a slot he never played before in either high school or at SCCC. DePew noted that Keith Bussey moved out to the wing, and that John Bervine gave us great minutes at the end . . . he did what he had to do, boxed out, grabbed rebounds and finished when he had the opportunity after a starter fouled out. After a couple of tough losses, including one that broke Sullivans long-standing home winning streak, DePew said that the Generals have recorded seven straight wins and are starting to get their swagger back. Another good win occurred last Tuesday night when SCCC was down 14 points to host Westchester CC with only six minutes left on the game clock. But the Generals outscored Westchester 19-2 in those final minutes to record a 70-65 victory. Looking ahead to the rapidly approaching 2004 NJCAA Region XV Tournament, which SCCC will host from February 27-29, DePew said his team will be ready. Were going to go in there with bells on, he said.